If you heard of or previously owned the Makita UC4030A, the UC4051A is an upgrade; the earlier version has been discontinued. Amazon is selling it for the slightly elevated price, but it is well worth it; value for money is high with the Makita UC4051A, as you will presently find out. Chain saw adjustments are completely tool-free and both the exterior design and oil pump are enhanced and improved. It is great for everyday cutting and trimming, whether at home or professionally. There are several important advantages in the Makita UC4051A. The new UC4051A (replacing the UC4030A) comes with better design features like fresh vent designs, adjusting dial changes, and enhanced chain adjuster. A mighty 15-amp motor (built-in) is one of its highlight features, one that enables completion of almost all cutting and trimming tasks. Its whole performance value rests on what this motor can accomplish. The power that this chainsaw can churn out is quite exceptional. For a corded electric saw, it works as powerfully as a gas chainsaw (of equivalent size and type). The Makita motor is original and you will not find its sort in any other brand of chainsaw, even in other 15-amp electric chainsaws. Amperage and cutting efficiency go hand in hand. This saw works marvels when it comes to smooth and quick cuts, similar to what a saw twice its cost can achieve (this is the value for money we mentioned earlier). The quality of its construction or build is rather high. This ensures durability and a long lifespan; if all is done properly on maintenance days. Heat damage can several restrict or damage the motor. Makita has thought of this too and provided a failsafe mechanism. The UC4051A has a current limiter that does the job of cutting or reducing power supply to the motor in case of overloads. This highly productive chainsaw is the result of an electric chain-brake feature; this also increases the product’s lifespan. Also ensuring productivity is a large metal spike bar. You will find some of the smoothest start-ups with Makita UC4051A. It makes little to no noise each time it comes to life. Maintenance is a breeze and the product itself produces zero emissions, making it ‘green’ oriented. If you wish to perform continuous cutting for a while longer than usual, the automatic chain oiler feature makes it a cinch. You need not do this manually anymore, the saw oils itself drawing from the built-in reservoir (which you need to keep filled). The switch is designed after a gun-like trigger and is big enough for easy usage. The grip is rubberized, in fact the whole saw is designed ergonomically. This has made it quite user-friendly. It comes with a 1-year warranty and a 30-day money-back return policy. For all its worth, it is not and never can be a logging chainsaw. This means heavy-duty cutting is out of the question; you can use it for light- to medium-duty tasks. The smaller the file radius, the smaller the chip. This reduces wear and tear on the saw. This also means that you will need to replace the stock chain and file – go for a 5/32 file and 15-degree for the chain. Cutting is made easier this way. 1. 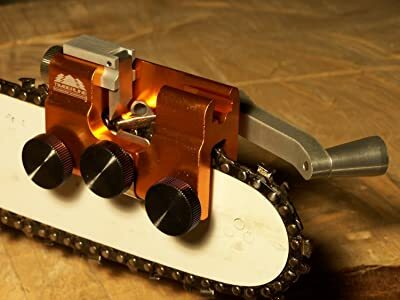 Usage – Self-oiling and tool-less chain tensioning make for an admirable chainsaw with limited maintenance demands on the user. Its motor is highly efficient and, coupled with noiseless start-ups, makes for an user-friendly chainsaw that can be used for hours thanks to its ergonomic design and overall durability. 2. Safety – Needless to say that even though this chainsaw is easy to handle and brings none of the handling dfifficulties of some other saw types out there, wearing protective gloves (industrial grade) is a cautious decision. The Makita UC4051A is no exception to the rule. You can use safety goggles to keep any flying debris out of your eyes. Your clothes must be tough but not burdensome; get ones that have tough materials but are not heavy on you. Fine dust often rises into the atmosphere during cutting and trimming tasks. It is best to use a facemask or tie a handkerchief across your lower face. The Makita UC4051A is a professional’s dream come true. It works via a powerful 15-amp motor and makes short work of most trimming and cutting tasks. The low-maintenance electric chainsaw is ideal for long-term use (auto-oiling, overload failsafe, ergonomic design). While it is indeed safe in a lot of regards, it is best to take every safety precaution needed where chainsaws are concerned. The bar and chain is 16 inches, which is quite useful when it comes to working medium-duty projects. Small-duty tasks are also possible with the Makita UC4051A but not any heavy-duty work like the felling of large trees. 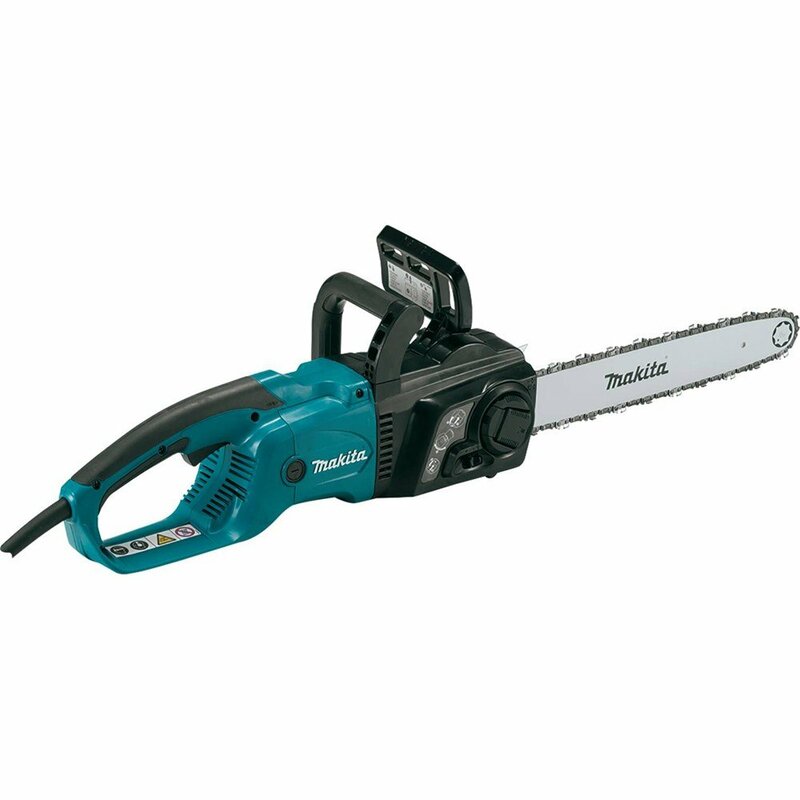 The cost may seem lofty at first but given the innovative design elements, original Makita motor and its capability, and how this electric saw works much like an equivalent gas powered chainsaw imparts to the product high value for money. In other words, DIY-ers and professionals alike will find it a practical and reasonably priced power tool to add to their collection.